In October 2012, just after the Olympics, the Barrett Values Centre (BVC) conducted a survey of the UK’s values The UK National and Community Values Assessment. This was one of 26 such country surveys that have been conducted by BVC around the world. The survey was conducted in partnership with the Office for National Statistics (ONS) amongst a representative sample of 4000 UK residents. What are your top ten personal values? What are the top ten values you experience in your local community? What are the top ten values you experience in the nation? What are the top ten values you would like to experience in the community? What are the top ten values you would like to experience in the nation? 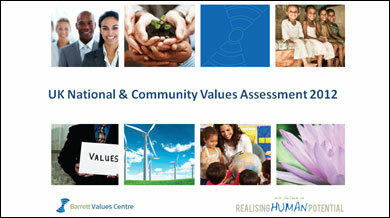 The results showed quite a high degree of synergy between people’s personal values and the values of their community. But they revealed significant dissonance between people’s personal values and the values they perceived at a national level. These results led to the formation of the UK Values Alliance.